We got a call from Paula Thompson two days ago that her greyhound Dakota was having difficulty walking and was losing weight quickly. He had all but lost movement in his leg. The vet she had taken him to had diagnosed the problem as a sprain but the medication did not seem to be helping him. We advised her to take him to our vet for a second opinion and she made an appointment for that afternoon. Paula called us from the vet’s office to tell Us that an x-ray revealed that Dakota’s leg as eaten by cancer. She let him go to the Rainbow Bridge. We met Paula six years ago at the Hagerstown Petsmart. She had greyhounds and was involved with another group for years. We talked and it started a friendship which has lasted up to the present. Paula became a volunteer for our group and she and her friend, Rob, hosted meet and greet events at the Hagerstown Petsmart for us for several years. Dakota was one of the dogs that was always at the meet and greets because he was such a friendly boy. 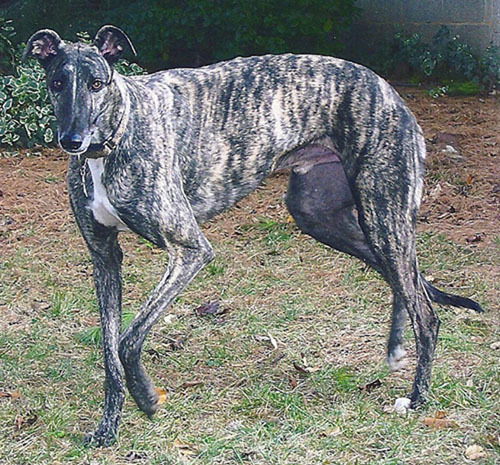 Over the years, Paula adopted two greyhounds from our group. She lost one to cancer last year and has one greyhound, Miley, left now. Dakota came to me off the hauler, a tall, lanky tan on black brindle boy. He was regal, nervous and my heart pledged eternal love. He was three days off the track and didn’t have a clue, which leveled the playing field because neither did I. My friend Rob had greyhounds and with his help, Dakota and I conquered everything fearful. We helped him learn to climb up and go down the steps; that he could not just “morph” through the door – that it had to be opened; that the food he was given was all his own. He learned how to play with toys and that it was okay to be himself. He learned that his human was slow when it came to chasing squirrels but that it was okay to chase them. He learned that his human made lots of noises that he did not undertand, like laughter and sadness, but he became used to them. He came to the door when I would come home from work and greet me like a long lost friend. He and I learned and grew through each other and it was such an amazing journey. He won’t be greeting me at the door any longer. He developed osteosarcoma in his right leg and I helped him to cross over the Rainbow Bridge on June 19th. As I held his head in my lap and told him I loved him and that I was sorry, he looked up at me for a moment and then he was gone. My forever friend. We know that Dakota had a loving home with Paula and that is all that any greyhound deserves.